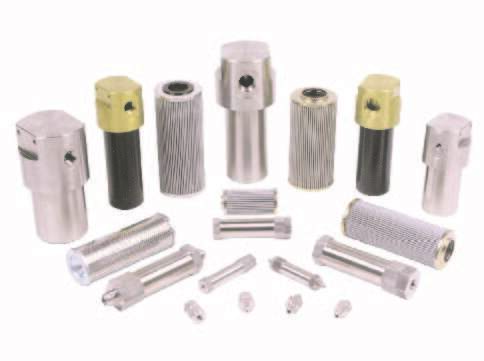 An assortment of in-line process fluid filters. Image courtesy 3B Filters, Inc.
Industrial, commercial, and scientific processes and operations very often have liquids or gases flowing through them. We use fluids for a wide variety of functions, as a motive force, as a solvent, and countless other things. Anytime a fluid is in use, the design of the devices comprising that system generally rely on a limitation of particulate matter larger than a maximum diameter. Filters are designed to capture and retain foreign matter that might otherwise cause wear, damage, or other unwanted impact in a fluid system. Filtration assembly selection relies on several factors. Correctly specifying a filtration unit will reduce the potential for adverse impact on the process and achieve the desired level of protection. Media Compatibility - Construction materials for housings or bodies, filter elements, gaskets, and other parts exposed to the process media must accommodate their potential corrosive effects. The inverse is true, as well. The filter unit materials must be evaluated for their potential impact on the media. Temperature - Filter element, housing and gasket components should be compatible with anticipated extremes of process temperature. Some additional headroom never hurts. Pressure - The containing portion of the assembly must be rated to withstand the full range of possible operating pressures, again with a suitable amount of headroom. Flow - Size the filtration unit to handle the full range of process fluid flow without excessive pressure drop. Capture - Survey the needs of instruments or equipment intended to be downstream of the filter. These are the items the filter is protecting. What are the particulate contaminant limits or tolerances of the downstream devices? Whichever has the lowest tolerance for foreign matter is likely the governing element for filter particle size retention. The filter element, whether disposable or cleanable, must be selected to prevent or appropriately limit passage of the particle size range that will impair operation of the downstream components. Retention - As particulates are trapped by the filter, the unit begins to clog and pressure drop increases. Processes will have varied filter element replacement protocols along the continuum of whether filter elements are changed regularly or left in place until flow impairment. Select a filter element size suitable for the anticipated contaminant load of the process. Higher levels of expected particulates generally indicate a need for a larger filter element to provide the capability to retain the contaminants while still allowing for sufficient passage of clean fluid. There can be many other considerations for filter selection that may come into play for specific installations. Most important is to not forget to put filtration protection in place. It is cheap insurance against excessive wear and damage to sensitive instrumentation and equipment. Share your filtration requirements and challenges with product application specialists. Leverage your own process knowledge and experience with their product application expertise to develop effective solutions.